Single Pole Battery Transition Boxes rated at 2000A for 5 strings of 630Vdc batteries used within an uninterrupible power supply or renewable energy storage application. 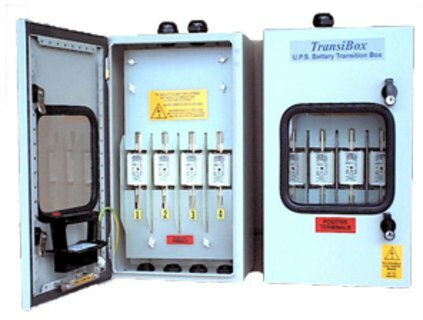 The table shows the continuous nominal current rating and this should be used to match a TransiBox to a UPS operating at full load, and with one less battery string than the number of ways provided in the enclosure. The maximum current ratings are 15 minute ratings. All ratings are shown for guidance only.